Creating an organized bathroom is easier than you think! There are various ways to organize your bathroom so that everything has a place that is easy to see and access. Look around your bathroom and see what is out in clear view on the counter, in the shower or the back of the toilet because you do not have a place to store them. Ask yourself, are there any items that can be stored in another room? Being organized saves time rather than struggling to find what you want and helps make your day go smoother. 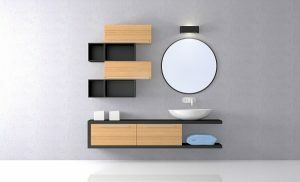 With a cluttered vanity or sink base, the easiest solution is to replace a mirror with/ or install a recessed or surface mounted medicine cabinet to store these items. Medicine cabinets come in various sizes and have adjustable shelves. The inside can easily be mirrored and may also have a pull-out magnified mirror. In fact, the mirror of the cabinet can even be framed to match the vanity. Also, wall hung storage cabinets can be installed at various convenient locations. Consider installing a roll-out appliance tray in the vanity to store your hair dryer, curling iron and hair brushes or a bottom roll out tray for easy access to cleaning supplies, tall bottles or to store additional towels. If you have a large drawer, consider dividing it into smaller spaces with a drawer divider or a makeup tray. With various size drawers and accessories, you can personalize your drawer space. You may even choose to install an outlet in this area. Shower shelves can be placed anywhere in the shower. Or you may want to install shelves outside of the shower to store your bathroom needs. When remodeling your bathroom take into consideration shelves that can be recessed in the tiles or corner shelves. When designing your bathroom, you’ll really want to give yourself the space to be organized and have a place for all your things. Magazi Kitchens and Baths and A.G. Building and Remodeling will work with you to meet your budget and accomplish improvements that will make a statement and allow you to enjoy your space. Relying on 25 years of experience with kitchen and bath planning and remodeling, Magazi Kitchens & Baths works with you to understand your dream for the space. By combining the talents of a designer and installer that work together every step of the way, we ensure your project is built in the most efficient and economical way. Our work spans Montgomery, Howard, Baltimore, and Anne Arundel Counties, including the towns of Bethesda, Silver Spring, Rockville, Kensington, Olney, Gaithersburg, Columbia, Ellicott City, Annapolis, and more. Be sure to follow us on Facebook, Google +, Twitter, and LinkedIn! This entry was posted on Wednesday, September 13th, 2017 at 12:52 pm. Both comments and pings are currently closed.